Ovulation is the release of an egg from the ovary. The egg passes into the fallopian tube where it is ready to be fertilized. In order for pregnancy to occur, the egg must be fertilized by sperm within 24 hours after its release. Immediately prior to ovulation, the body produces a large amount of luteinizing hormone (LH). This is known as the "LH surge" and usually takes place in the middle of the menstrual cycle. LH triggers the release of an egg from the ovary. The LH One Step Ovulation Test Device (Urine) is a complete system to help you predict the time of ovulation and peak fertility. It is during this fertile time that pregnancy is most likely to occur. The LH Ovulation Test Device (Urine) detects the LH surge in urine, signaling that ovulation is likely to occur in the next 24-36 hours. Important: The LH surge and ovulation may not occur in all cycle. •Determine the time you will collect your urine. For best results, collect your urine at about the same time each day, for example, between 10:00AM and 8:00PM. Some women have found that their best specimen is after 12 noon. Do not collect your first urine after waking up. •Reduce your liquid intake approximately 2 hours prior to urine collection. •Be sure to write down the cycle day, date and time that you collected your urine in the "Test Results Chart". •You can store your urine for testing later in the day. Your urine can be stored at room temperature for up to 8 hours or in the refrigerator for up to 24 hours. Do not freeze it. For best results, test your urine on the same day that it is collected. If you refrigerate your urine, let it reach room temperature before testing (about 30 minutes). Do not shake the container. If sediment forms at the bottom of the collection container, allow the sediment to settle. Use only urine from the top of the container. Determine the Length of Your Menstrual Cycle. your Menstrual Cycle Length is the number of days from the first day of your period (menstrual bleeding) to the last day before your next period starts. Think back over the last few months to decide what your usual cycle length has been. Circle your usual cycle length on the WHEN TO START CHART below. Select the number directly underneath. Starting the first day of your last period, count ahead the selected number of days on your calendar. This is the day you should begin testing. Allow the test device, urine specimen and/or controls to equilibrate to room temperature (15-30°C) prior to testing. Determine the day you will begin testing. (See the above section: "WHEN TO START TESTING"). Place the test device on a clean and level surface. Hold the dropper vertically and transfer 3 full drops of urine (approx. 100mL) to the specimen well (S) of the test device, and then start the timer. Avoid trapping air bubbles in the specimen well (S). See illustration below. COMPLETE INSTRUCTIONS COME WITH EACH TEST KIT. 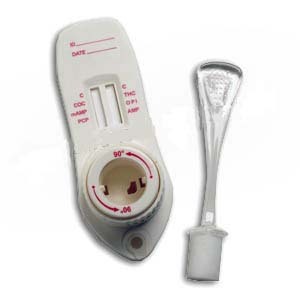 A rapid, one step test for the qualitative detection of luteinizing hormone (LH) in urine. For professional in vitro diagnostic use only. The LH One Step Ovulation Test Device (Urine) is a rapid chromatographic immunoassay for the qualitative detection of luteinizing hormone (LH) in urine to aid in the detection of ovulation. •For professional in vitro diagnostic use only. Do not use after expiration date. •Do not eat, drink or smoke in the area where the specimens or kits are handled. •Handle all specimens as if they contain infectious agents. Observe established precautions against microbiological hazards throughout the procedure and follow the standard procedures for proper disposal of specimens. •Humidity and temperature can adversely affect results. The kit can be stored at room temperature or refrigerated (2-30°C). The test device is stable through the expiration date printed on the sealed pouch. The test device must remain in the sealed pouch until use. DO NOT FREEZE. Do not use beyond the expiration date.